Juno Mak Chun Lung's directing debut RIGOR MORTIS (GEUNG SI) participated in the Venice Day and two days ago held a screening there. Some Mainland media felt that this JU-ON's Takashi Shimizu produced film from cinematography, art and character designs to martial art action were very stylized. Nina Paw Hee Ching who waited for her companion to take into a vampire even had an over 2 minute long monologue that was very memorable. Reportedly the film has already sold its U.S. and Canada distribution rights. 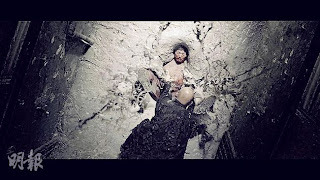 In RIGOR MORTIS the Chin Siu Ho played out the hill action film star moved into a public housing estate unit 2442 and decided to commit suicide, but he ran into some people who changed his fate.